Hrithik Roshan Shares His Journey of Recovering From Body Ailments and The Video is SUPER Inspiring! This weekend is going to be a treat for the movie buffs. The number of movies releasing in theatres this Friday is quite big. We have a good and rare mix of Bollywood and Hollywood, for your taste in theatres this weekend. Add to the list, the movies which would be carrying on from previous weeks. Also, let us not forget the regional movies. So, the fight for getting the maximum screens is going to be big after this Friday. Akshay Kumar's Kesari will surely continue to occupy screens. Mard Ko Dard Nahi Hota's word of mouth is pretty damn good, so it will also continue to run in some screens. Though, the biggest release this weekend would be Salman Khan's production, Notebook. The hype around the movie is pretty good. The romantic will also work as the launchpad for two new faces in Bollywood, so the hype around that is also working in its favour. Right behind it is the action-adventure, Junglee. Suckers for action will definitely go and watch this one. So, here are the names of all the big movies opening in theatres this week. Salman Khan's production venture stars newbies Pranutan Bahl and Zaheer Iqbal in lead roles. The trailer and the songs of the film have been very well received. Makers have also invested good time and money in promoting the romantic film. Ask us, then the trailer of this action adventure was pretty damn good. We know Vidyut Jammwal is a master of action. We are going to see some exemplary action sequences set in the jungle through this film. The movie features a lot of animals, so that would be a treat to watch as well. Jordan Peele's follow up to Oscar-winning Get Out is Us. The horror movie stars Lupita Nyong'o and Winston Duke in lead roles. The movie centres on a couple and their two kids who have to fight off their evil doppelgangers in order to survive. The first trailer of the film makes it very clear that this film is not for the weak hearted. The story of Dumbo comes to life with this live-action film. The movie, designed especially for kids, has a baby elephant with the ability to fly, who has to rescue his mother. Awww! The plot is enough to let you know that this one will melt your heart. So if you have kids at home, this one should surely be considered. The buzz around this movie is the least of all. We can't help if a movie looks born and bred for the festival circuit. The movie tells the true story of an Australian missionary who helped people suffering from leprosy in India. The English film stars Sharman Joshi in a key role. This one is going to be tough to watch. The movie is set on the backdrop of the terrorist attack on Mumbai in 2008. Hotel Mumbai stars Anupam Kher and Dev Patel and will tell the story of survivors of the Taj Hotel, which was one of the terrorists' targets. The teenage romantic comedy has its separate fanbase. Five Feet Apart speaks specifically to this fans base. The movie stars Haley Lu Richardson and Cole Sprouse, who is very popular in India, and thus might attract an audience. The movie tells the story of two teens with cystic fibrosis, a genetic disorder, and forced to stay at least five feet apart from each other at all times. A romance develops between them anyhow. Five Feet Apart is not the only movie dealing with a medical condition releasing this week. Gone Kesh talks about a girl with alopecia. The movie stars Shweta Tripathi in the lead role. It has been directed by Qasim Khallow. So, those are all the movies opening in theatres this week. The competition is going to be super tight this time around. Let us see which of these will survive and which ones will sink. 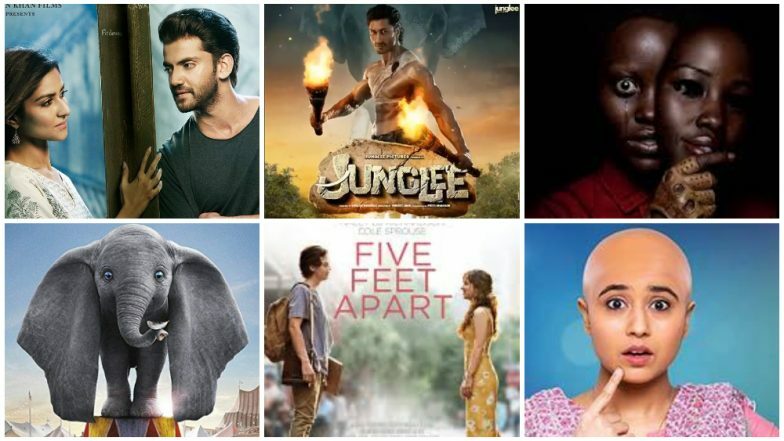 Stay tuned to LatestLY for the box office updates of these movies.